Hey everyone, just wanted to do a quick post on how to keep track of who's talking about you on the net. Nothing really unique, just a list of tools that I use often. Why is it important? Well, it's always interesting to know what people are saying about you and sometimes you want to engage in a conversation or just thank them for linking to your article. Twitter search is definitely the #1 source for keeping track of who's talking about you right now. But you already knew that. 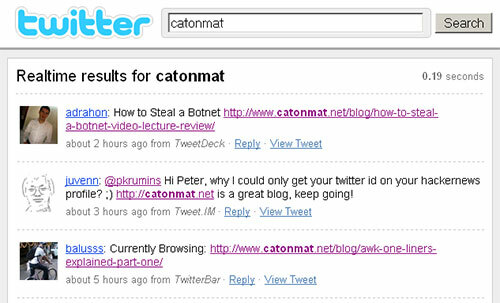 Twitter search example for the term "catonmat." Perhaps what you didn't know is that they have an RSS feed for search queries. Location of RSS feed link for Twitter search results. Now combined with a service like feedblitz.com you can email the RSS updates to yourself or just read them from your favorite RSS reader. I am monitoring terms "Peteris Krumins", "pkrumins" and "catonmat". Google Alerts automatically notifies you when the Google search engine locates new results for your search terms. You can choose to have your alerts delivered via email or RSS feed. Google Alerts email for the term "catonmat." You can even customize the type of alerts you want to receive. Google Alerts lets you choose to get notified when a new result appears on web pages, usenet (google groups), blogs, news or videos. Backtype is Google for comments. Want to find out when someone's mentioned you on Reddit, FriendFeed, Digg or Hacker News? Backtype will alert you. Backtype Alerts email for the term "peteris." Backtype also recently launched a service called BackTweets that allows you to find who's linking back to you via shortened URLs. Have fun keeping track of yourself! Btw, let me know in the comments if I missed any other cool tools.